First, reboot your server and when you enter the Kernel Selection menu, press e to modify the parameters to boot the kernel. The next screen will show you a confusing screen of kernel parameters. It'll look like this. Scroll down until you find the actual kernel line. 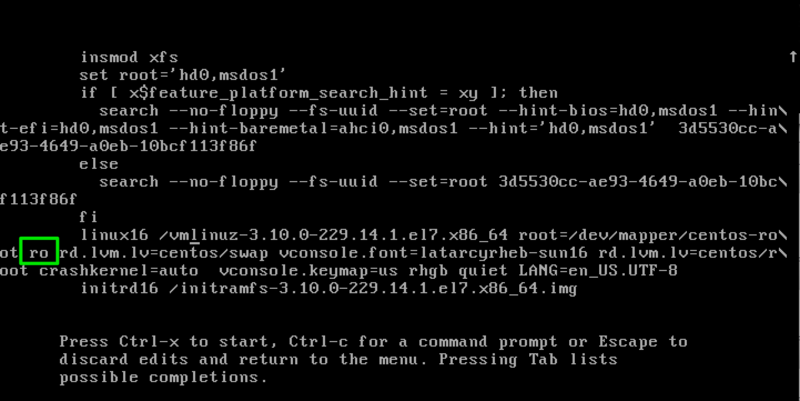 It starts with linux16 /vmlinuz-... and will span a couple of lines. 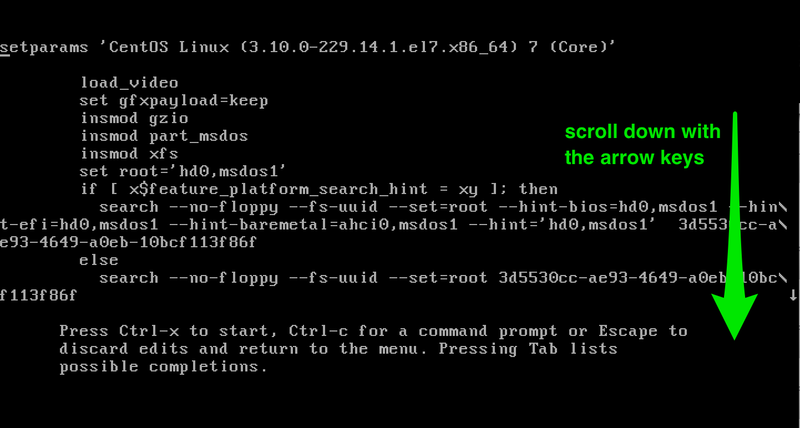 You're now looking for the ro keyword in the kernel linux, which would start the OS with a read only (ro) file system. Use your arrow keys to go to the ro line and replace it with rw init=/sysroot/bin/bash. The result should look like this. If that's the case, press ctrl+x to boot the kernel with those options. If everything went fine, you're now in a limited shell with access to the entire filesystem. To make things easier, you can chroot the filesystem so you can access all your known files/directories with the same paths. If you're done working in single user mode, reboot again by pressing ctrl+alt+del. Update: as a reader pointed out, you may have to remount the filesystem from readonly to read-write, too. After that, you should be able to make changes to files on the disk that persist on reboot. afaik, this only works on physical machines. 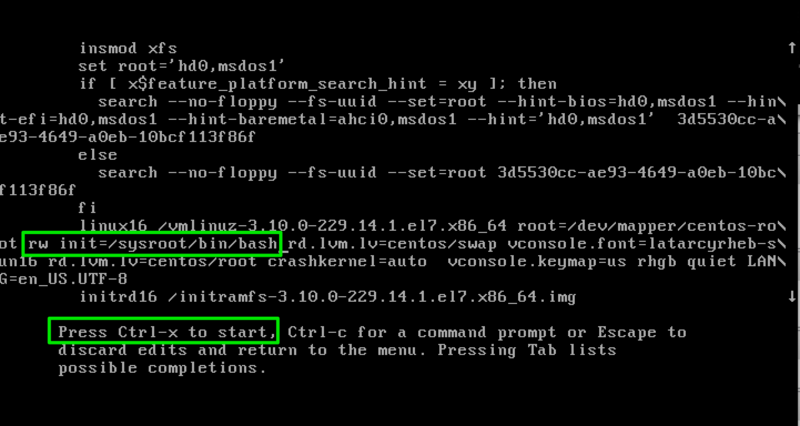 When single booting vm’s you should replace init=/sysroot/bin/bash with rd.break . You also might want to load the SELinux policy. I tested this in VMware/Virtualbox and it still seems to work (at least: it did in my tests). As for SELinux: you are indeed right, that should/could be added. Including a rm -f /.autorelabel to avoid having to relabel everything on next boot. Good point, I’ve updated the article to reflect that. Thanks! You don’t really describe how to boot into single user mode – you describe how to boot with bash as PID=1 – i.e. as init replacement. Booting into single user mode usually means booting to runlevel 1. 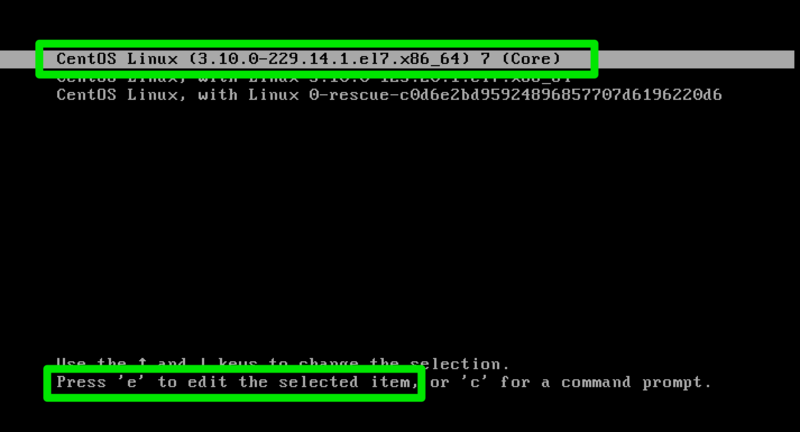 And with CentOS/RHEL this is accomplished via adding ` 1` to the kernel command line. The system then boots into runlevel 1 where you are able to reset your root pw and stuff like that. This also automatically takes care of SELinux. Instead of the rw init=/sysroot/bin/bash, one could you append to the end of that line init=/bin/bash. Drops to single user prompt. Then do the remount. You saved my life today. Thanks! Hi All, I have a problem related to this issue. My system was setup in Oracle Virtual Machine VM (CentOS 7). The system will direct boot up OS without showing the GRUB screen. I have tried to interrupt the booting sequence with key strokes at the begnning, “e”, function keys and even “Shift” holding suggested by Ubuntu. Yet the booting continues. How can I invoke the GRUB menu? Will there be possibility the GRUB has been removed or disabled?